The dollar store is on my way home from work so I seem to stop there at least once a week to pick up a few things. It is actually a great place to buy every day household items such as cleaning products, wrapping paper, greeting cards, and any arts and craft supplies. People may make fun, but we should actually be spending more time shopping at dollar stores and getting items for a dollar, rather than spending more in big box stores and drug store chains where you really have to open up your wallet. The dollar store sells items that most people need out of necessity, not just out of impulse, and cleaning products are probably the most common. They are usually very expense when purchasing at big box stores, but actually the dollar store has carpet cleaning powders, shower sprays, dish soap, and furniture polish that are just as good as the competitor’s, but at a lesser price. Cleaning items such as mops, scrub brushes, buckets, and sponges should be considered as purchases, and remember everything is only a dollar! You can stock up or stop in when you need something and the prices never go up. The products are not always brands you may be familiar with, but that is not all bad, as they work well and will still do the job. 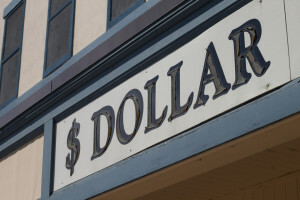 Dollar stores do not break the bank and unless you are obsessed and do all of your shopping there it will not require you to get loans to be saved, so if you can manage, it can actually save you money. For children the dollar store is a great place for coloring books, markers/crayons, poster board, and all types of craft supplies. You can do a school project or home craft on a raining day for just a few dollars that may be five times as much at a big box store. They actually have more than a couple full aisles of just arts and crafts supplies, so there is something for everyone. It is also a great place to get seasonal décor, such as ornaments, Christmas cookie cutters, or St. Patrick’s Day apparel, 4th of July flags, and all the Halloween decoctions that you can imagine. If you are doing some cooking for a crowd on a budget for one of the big holiday events, the dollar store has some many necessary kitchen tools and accessories to make that day a success. They sell serving dishes, paper plates, napkins, utensils, table clothes, and aluminum foil. The dollar store is a great place to save money by purchasing items to throw a party on a budget, not to mention keeping your house clean! The only downside is that I would not suggest buying food or personal care items such as soap and shampoo from the dollar store, as those may not be up to personal standards, but if you’re in a bind and need something quick and cheap, the dollar store might be your place! Two comments…first I disagree about buying food. My dollar store sells the best snacks, especially pretzel nuggets at a dollar for a 16 oz. bag, and the same brand is $2.69 at our grocery store. Second, we have fun at our dollar store. We’ll set a “gag” budget of, say, $10.00 and will buy enough Christmas decorations to do a neighbors outdoor tree, or cover their porch with mini-pumpkins and gnomes for Halloween. We call it our “silly budget”, and it never exceeds $10.00. It is definitely a great place to save money … I am unashamed with my purchases at our local dollar stores!